One of the best way to find ways to improve your own website is to look at the competition to see what they do, and what you can learn from them. 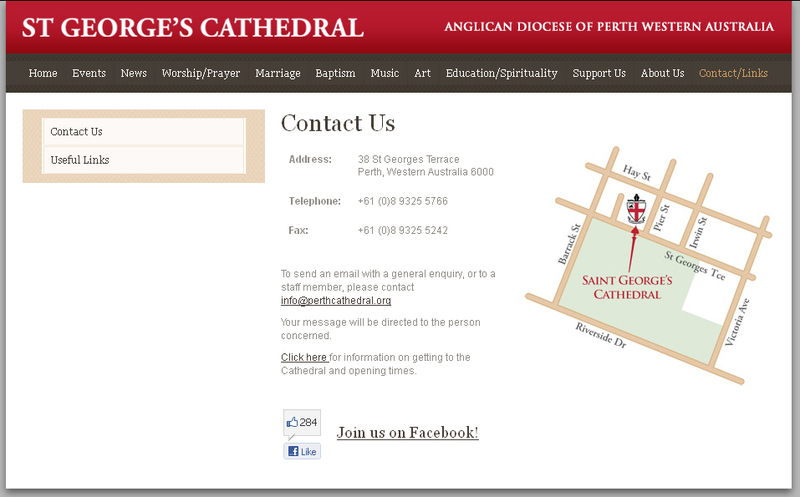 Today, I’m looking at the website for St George’s Cathedral, Perth. The home page has a rotating flash banner with well-chosen images, with a message over the top of each image. Below that is a three column layout where there is an image based navigation on the left, a short welcome note, including a link to sign up for the e-mail newsletter, and Latest news in the centre column, then a virtual tour and upcoming events in the right column. A top-based horizontal navigation means that users are quickly presented with all the navigation options without having to scroll down. The navigation links are clearly written so as to have no confusion as to what you will find there. While there are a number of pages on this website, I’ve decided to look at the about page, as I feel it is one of the most important of a website. As there is a lot of information to convey about the Cathedral, it is split up into separate pages, which can be found via the left hand navigation in this section. This allows for more in-depth information that isn’t needed on a general about page. 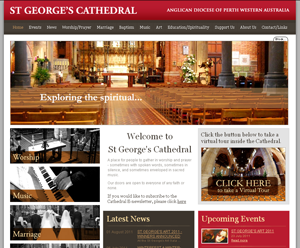 This Anglican cathedral does have a social media presence, having a Facebook page. However, it is not very prominent, being only found at the bottom of the contact page. This is probably because the website was developed before there was a social media presence, and as such there wasn’t room to give it more prominence. The professionally taken photos really help make this website, and bring what could have been a stale website with lots of information to life. They have specifically moved to take the photos that would work best on the website, and make them the best quality photo for that purpose. It has a favicon, however I can’t really tell what it is supposed to be. Favicons are a tough thing to get right, and they should be simple, with two or three colours. It’s a small icon, so you don’t want lots of details. Horizontal navigation at the top of the page means that people can access the main parts of the website without having to scroll down. If you’ve got too much information to include in a single About page, split it up into multiple pages. Professionally taken photographs can bring a website to life. If you can’t afford a professional photographer, make sure you try to set up and take the photos that you want to use specifically for your website. If you’re building a website and don’t have a social media presence at the moment, make sure that there is room for it in the future. If you do have a social media presence, ensure that you position it prominently on the home page at least, if not on every page.